My working life began as a shipwright in the Australian Navy and as a jack-of-all-trades, I can turn my hand to almost anything. After the navy, with a management role in construction with glass blocks, I had my hands off the tools for twenty years. I’ve now come full circle – I’ve returned to crafting with my hands, working as an artisan. This time creativity and fun are part of my working day. I’ve always had a passion for glass and glass blocks, in particular. The glass block is a versatile, pristine container, the perfect size for practical use around the home. When we decided to change our lifestyle, I began to create simple designs on the surface of the blocks. It’s developed into a new way of working with glass. Glass etching is an ancient method of reproducing images on glass. I create a design, which I print on vinyl and attach to the glass. I then etch the design into the glass using a sandblaster. For more complex designs, I use an engraver. 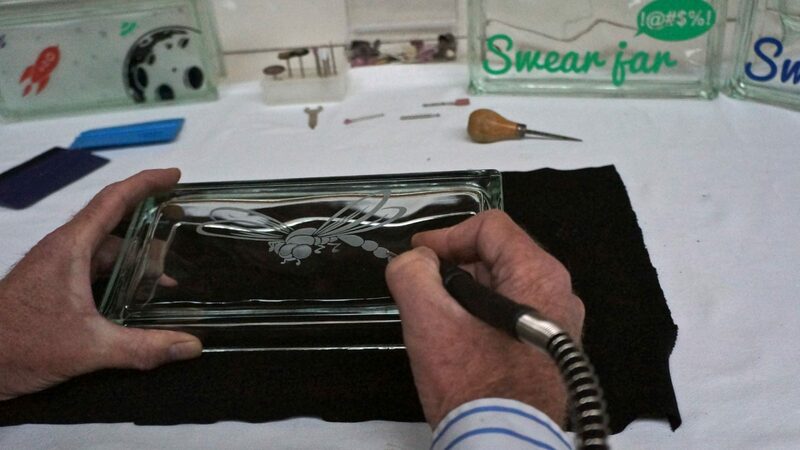 Engraving the glass in different layers creates depth and the design is revealed gradually. The final effect is a multi-dimensional, rich textured finish – magical! It’s a change of pace working in my home studio. There’s no commute, no-one to direct or oversee, no more employees. I now live near the ocean which provides inspiration. The objects I make are fun, interesting, unique, and practical. And the properties of the glass block — heavy, robust, durable, with a sparkling finish — make it a versatile container which can be used in myriad ways. These days, instead of being concerned about employees, I have more pleasant thoughts about making objects to please my customers. Enjoy shopping here. I’m sure you’ll find a gift — for yourself, a friend, or a loved one — that will bring joy.